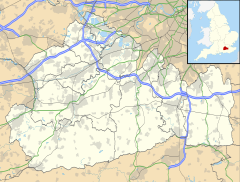 West Horsley is a semi-rural village between Guildford and Leatherhead in Surrey, England. It lies on the A246, and south of the M25 and the A3. Its civil parish ascends to an ancient woodland Sheepleas Woods which are on the northern downslopes of the ridge of hills known as the North Downs in the extreme south of the village, and cover about a tenth of its area, 255 acres (1 km²). The bulk of West Horsley's land is north of the Surrey Hills AONB, the rest is within it. West Horsley appears in Domesday Book of 1086 as Orselei held by Walter, son of Othere. Its Domesday assets were: 8 hides; 1 church, 8 ploughs, woodland worth 20 hogs. It rendered £6 each year to its lords of the manor. Both Horsleys were burnt to the ground during the Norman conquest of 1066 since its Saxon thane, Brixsi, was brother-in-law to King Harold and refused to submit. The village was part of the lands given to the Norman, Walter Fitz Otha, the new constable of Windsor Castle. The population fell dramatically during the Black Death and the land was given over to grazing, since the peasant population was insufficient for farming. In 1636, during a court case concerning a tithe dispute, a witness called Henry Mabbinck testified that he played cricket "in the Parke" at West Horsley, one of the sport's earliest references. Beatrix Potter, best-selling author of children's books, used to stay at a cottage in the village, Tyrrellswood with her aunt and uncle, and created many of her paintings of animals and wrote some of her books there. Around the same time period, Helen Allingham painted an image of the village, "Children On A Path Outside A Thatched Cottage, West Horsley, Surrey". Bill Pertwee, who played the air-raid warden in Dad's Army, lived in East Horsley during the time of his role. He is locally famed for appearing in the local pub and the youngest person singing the theme tune Who do you think you are kidding, Mr Hitler? as he entered. Maartje Tamboezer, the second murder victim of John Duffy and David Mulcahy (branded the 'Railway Killers'), was killed in West Horsley in 1986, although Horsley railway station itself is in East Horsley. The bulk of West Horsley's land is north of the Surrey Hills AONB, the rest is within it. St Mary's Church, is a flint Saxon building dating from 1030 and is Grade I listed. The church was spared when the rest of the village was burned in 1066. Its tower was added in 1120, and the church extended to its current size in 1210. West Horsley Place is a medieval house that was substantially reconstructed between the 16th and 18th centuries. It shares in top-ranked listing status for architecture. Acquired in 1931 by the Marquis and Marchioness of Crewe, after the death of the Marquis in 1947 it was left by his wife (Peggy née Primrose d. 1967) to their daughter, Mary Crewe-Milnes, Duchess of Roxburghe (23 March 1915 – 2 July 2014). On her death in 2014 it passed to her great-nephew Bamber Gascoigne, the grandson of her much older half-sister Lady Annabel Hungerford Crewe-Milnes. This long-established motor dealers bearing its original name rather than that of its products, occupies a site accessed next to the roundabout leading onto the village main street from the A246. The Sheepleas Woods are a beech woodland and grassland on the northern downslopes of the ridge of hills known as the North Downs in the extreme south of the village, and stretch to 103 hectares (255 acres) (1.03 km²) within the Area of Outstanding Natural Beauty. This similar sized and shaped area of woodland is slightly higher than Sheepleas open space. The Raleigh School is a popular two-form entry co-educational primary academy. It is an inclusive school which takes children from 4 to 11, and also has a privately run Nursery on site that admits children from the age of 2 1/2. The vast majority of children move on at age 11, to the Howard of Effingham School. The village is served by Horsley railway station, in the nearby village of East Horsley. It lies on the A246, and south of the M25 and the A3. David Ogilvy, "The Father of advertising"
^ a b "West Horsley Parish Council | History of the village". www.westhorsley.info. Retrieved 25 February 2016. ^ Bowen R (1970) Cricket: A History of its Growth and Development, pp.261–267. Eyre & Spottiswoode. ^ St Mary, West Horsley by the Leatherhead Road, Grade I listing Historic England. "Details from listed building database (1377828)". National Heritage List for England. Retrieved 26 November 2013. ^ "West Horsley Parish Council | History of the village". www.westhorsley.info. Retrieved 25 February 2016. ^ "Church History: St Marys". stmaryswesthorsley.co.uk. Retrieved 25 February 2016. ^ West Horsley Place, Grade I listing Historic England. "Details from listed building database (1188949)". National Heritage List for England. Retrieved 26 November 2013. ^ Obituary for Mary Innes-Ker, Duchess of Roxburghe, announcements.telegraph.co.uk; accessed 12 July 2014. Wikimedia Commons has media related to West Horsley.